The Fellowship was fortunate enough to obtain a copy of MASKS #1 from Dynamite Comics. The story is by Chris Roberson with painted art by Alex Ross and letters by Simon Bowland. The Green Hornet and Kato are in New York trying to get information regarding “Boss” Rothko which leads to an encounter with The Shadow. The heroes learn about the newly formed “Justice Party” which recently swept the city and state elections. New radical legislation is passed as well as the creation of a new law enforcement agency, but things are not what they seem. The party is essentially a criminal organization which our heroes team up to take down. The Spider shows up just in time to give them a hand, but they may need more help than that. I’ve been waiting for this meeting of the pulp heroes ever since it was first announced. This is a very good start to what I hope will be an action packed mini-series. 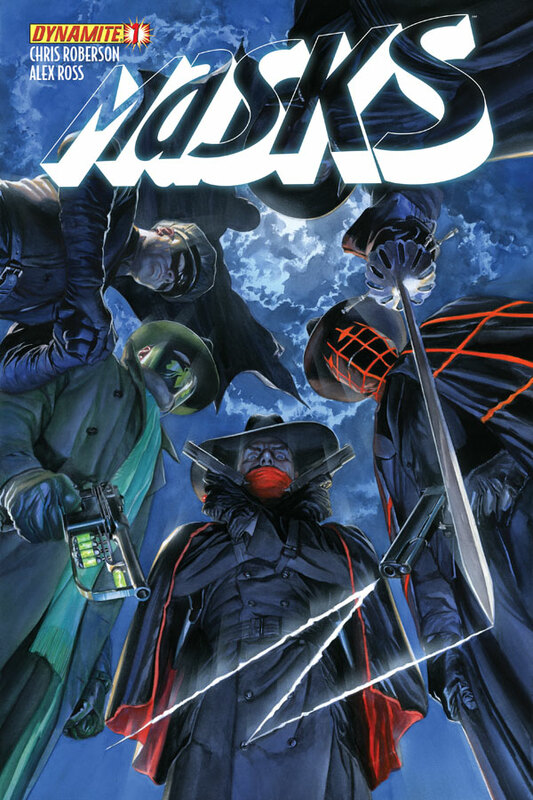 It will be cool to see who else shows up; a modern day Zorro was referenced in this issue. The idea of a criminal political party is a neat idea and (to my knowledge – I’m sure someone will correct me) has never been used before. I must point out the lack of the obligatory first meeting of heroes fighting (though not for the lack of effort on Kato). That is VERY refreshing. Alex Ross does his usual incredible artwork both on the cover and the interiors. I hope this is successful enough for a sequel and Dynamite will be able bring in other pulp heroes (Doc Savage, Phantom, The Avenger for example). MASKS #1 is in stores now and available at www.dynamite.net.